Stella (PC 41) found a peanut worm (Phascolosoma agassizii) this afternoon while marking limpets in the Director’s intertidal. Its introvert is visible here as the long structure with brown transverse streaks. 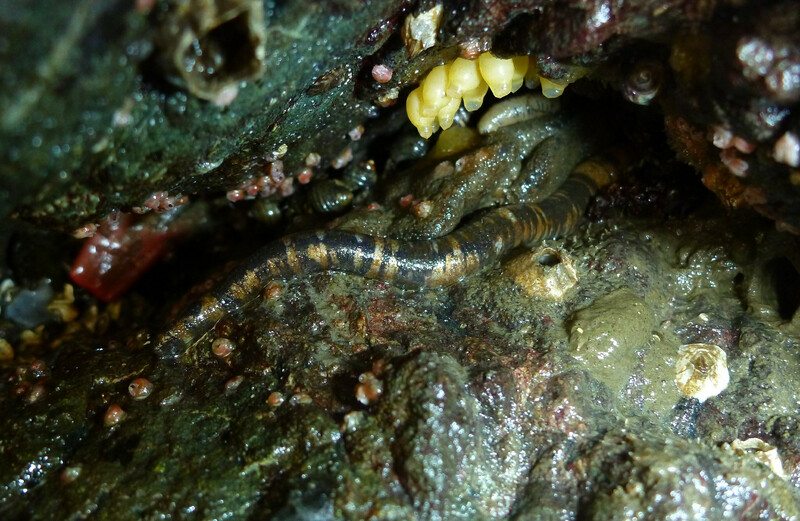 Also visible are dog whelk (Nucella ostrina) egg capsules above the peanut worm and several spirorbid tube worms on the surrounding rocks. Very cool find Stella! This entry was posted on April 22, 2015 at 1:29 pm and is filed under Marine organisms. You can follow any responses to this entry through the RSS 2.0 feed. You can leave a response, or trackback from your own site.